Completing further education, be it a bachelor’s degree online or associate’s degree at your local community college, is a worthwhile investment. Further education equips you with range of skills that will make you even more attractive to prospective employers and gives you the opportunity to learn more about subjects you love. Unfortunately, education is not cheap. Indeed, with college fees rising every year, funding your studies can at times be as difficult as actually completing your degree! However, there is a range of financial aid available to help students fund their education and ultimately invest in their future. Most students take out a loan to fund their education. However, it is important to bear in mind that, unlike scholarships or grants, loans usually require an origination fee and must be paid back with interest. The two main providers of education loans to students are the government and private lenders. Loans provided by the U.S. government generally offer the best interest rates and have better terms and conditions than private lenders. Therefore, it is always recommended that you try and get as much federal financial aid as you can before turning to private companies for help. The U.S. government offers a variety of student loans including: Perkins loans, Stafford loans, PLUS loans and consolidation loans. All of these loans have relatively low interest rates and a number of them are especially sympathetic to students in financial need. In order to be considered for a federal loan, you should complete a FAFSA, Free Application for Federal Student Aid. You can complete a FAFSA online, over the phone or even by post if you would prefer to complete the form by hand. 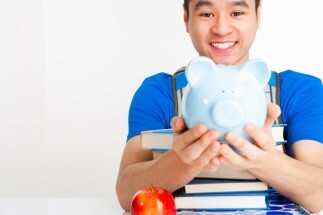 Sadly, federal loans do not cover all of the costs of college for some students. This means that they will have to turn to private lenders for financial assistance. While loans from private lenders tend to have higher interest rates, a number of financial institutions offer loans that are specifically geared towards students and therefore provide lower interest rates and generous repayment terms. As previously mentioned, the best students loans come from the U.S. government. Therefore, it is recommended that you file a completed FAFSA before looking for education loans elsewhere. However, if you do need to take out a private loan to help cover your education costs, you can find lenders both online and on the high-street. In order to get the best deal, shop around and be sure to take full advantage of price comparison websites.